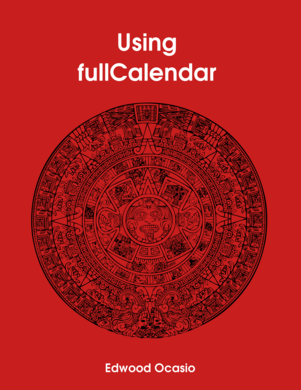 Added a chapter on how to use jQuery dialogs to create, modify and remove events from the calendar. The source package includes jQueryUI and its CSS so the samples can run out of the box. This upgrade is free if you already purchased the book. If not, learn more about it and decide if it will be useful to you. After the next chapter the price will change to $9.99 ($2 increase). Take advantage of the early adopters price. That happens because each event has a reference to its source, which has a reference to the event itself, effectively creating a circular reference that JSON.stringify cannot manage. // This is the callback that will be triggered when a selection is made. // Ask for a title. If empty it will default to "New event"
// year, month, day or week.